Does the FBI and Justice Department "Deep State" Need a Colonoscopy/Body Cavity Search? Papadopoulos was set up so the FBI could continue the investigation. This was done because the dossier used to get the FISA warrants to spy on Trump proved to be bogus. They couldn't use Page because there was nothing there. So they set up Papadopoulos who really didn't know what was going on. He was used as there justification to continue the investigation. He repeated what he was told that the Russians had the Hillary e-mails. Who knows if they actually have them for sure. Brennan appears to be behind the whole thing as he was coordinating with British intelligence. Chaffetz said that the reports regarding the informant are a "precursor" to upcoming, yet-to-be-revealed information. Two weeks later he flip flopped and supported Trump. Cambridge professor outed as FBI informant inside Trump campaign. A Cambridge professor with deep ties to American and British intelligence has been outed as an agent who snooped on the Trump presidential campaign for the FBI. Multiple media outlets have named Stefan Halper, 73, as the secret informant who met with Trump campaign advisers Carter Page and George Papadopoulos starting in the summer of 2016. Halper’s sit-downs with Page reportedly started in early July 2016, undermining fired FBI Director James Comey’s previous claim that the bureau’s investigation into the Trump campaign began at the end of that month. It is not clear if the professor was paid to speak with Trump campaign figures, but public records show that he has received large payments from the federal government in the last two years. The Department of Defense’s Office of Net Assessment — a shadowy think tank that reports directly to the secretary of defense — paid Halper $282,000 in 2016 and $129,000 in 2017. And we ask, who is colluding?? Very scary stuff for our democracy. Glenn Greenwald does a nice job of laying out the history of Halper. I guess that means you and Chafetz are in the same camp. From the Intercept article: Equally strange are the semantic games which journalists are playing in order to claim that this revelation disproves, rather than proves, Trump’s allegation that the FBI “spied” on his campaign. Really sharp response. Keep up the good work. I thought it was a pretty sharp response. You say Chaffetz's opinion means nothing. TA111 said your opinion means nothing. I would add that Chaffetz's opinion means a heck of a lot more than yours. “The Wall Street Journal asks, ‘WHERE IN THE WORLD WAS BARACK OBAMA?’ A very good question!” Trump tweeted. President Trump sought to turn the tables on the Obama administration Monday after demanding a probe into whether his predecessor’s FBI “infiltrated” his 2016 campaign, pointedly asking what then-President Barack Obama knew about the operation – while clashing with former CIA boss John Brennan. Following reports detailing how an FBI “informant” had multiple contacts with members of Trump’s campaign, the president said Sunday he’d formally seek a DOJ probe of whether agents surveilled the campaign for political purposes, and whether any such demands came from the Obama administration. While the DOJ swiftly asked the department’s inspector general to handle that review, the president turned the spotlight Monday to Obama. Every few weeks, Donald Trump and his Republican allies in Congress claim they’ve found something that will prove the Russia investigation was a sham—a “witch hunt,” in the president’s words—all along. Conservative media outlets build a steady drumbeat of hype, telling their audience that this is the proof they’ve been waiting for. Ultimately, in every instance, their claims fall far short. Shades of Obama "wiretapping" Trump Tower. Last edited by Swampy Meadows; 05-21-2018 at 12:38 PM.. The tables have been turned! Equal justice under the law? Hardly. A good read by Andrew McCarthy. You know how I know that you didn't read the article? Because you linked to it? Haha! Fair enough, I'll read it later. John Brennan, President Obama’s former CIA director, again used his verified Twitter account Saturday to lash out at President Trump, this time by threatening House Speaker Paul Ryan (R-WI) and Senate Majority Leader Mitch McConnell (R-KY). Senator McConnell & Speaker Ryan: If Mr. Trump continues along this disastrous path, you will bear major responsibility for the harm done to our democracy. You do a great disservice to our Nation & the Republican Party if you continue to enable Mr. Trump’s self-serving actions. But what was the rationale for using these spying authorities? The fons et origo of the counterintelligence investigation was the suspicion — which our intelligence agencies assure us is a fact — that the Democratic National Committee’s server was hacked by covert Russian operatives. Without this cyber-espionage attack, there would be no investigation. But how do we know it really happened? The Obama Justice Department never took custody of the server — no subpoena, no search warrant. The server was thus never subjected to analysis by the FBI’s renowned forensics lab, and its evidentiary integrity was never preserved for courtroom presentation to a jury. How come? Well, you see, there was an ongoing election campaign, so the Obama Justice Department figured it would be a terrible imposition to pry into the Democrats’ communications. So, yes, the entire “Russia hacked the election” narrative the nation has endured for nearly two years hinges on the say-so of CrowdStrike, a private DNC contractor with significant financial ties to the Clinton campaign. If you want to know the real origin for the investigation, go to the Obama Whitehouse. Was there really a spy inside the Trump campaign, as the president says? But it would not be absurd to think the FBI might have sent informants to speak to suspects in their counterintelligence investigation into whether anyone in the Trump orbit was working with Russia to interfere in the presidential election. In fact, it would have been accepted procedure for the FBI. Trump touts WSJ editorial: Where was Obama? “The Wall Street Journal asks, ‘WHERE IN THE WORLD WAS BARACK OBAMA?’ A very good question!” the president wrote on Twitter. Freeman argued Obama should provide details about his time leading the Department of Justice and FBI during the 2016 presidential race. Last edited by Showme Flyer; 05-21-2018 at 08:35 PM..
Obama has absolutely nothing to testify about. Swampy, the WSJ thinks Obama does have something to testify about - what he knew about the shenanigans of his Administration or for that matter if he was behind them. The chairman of the Senate Judiciary Committee asked the Justice Department Monday to turn over communications between former Associate Deputy Attorney General Bruce Ohr, British spy Christopher Steele and others about the infamous anti-Trump dossier. In a letter to Deputy Attorney General Rod Rosenstein, Sen. Chuck Grassley, R-Iowa, requested Ohr's emails, phone logs, written notes and text messages. Grassley also asked the Justice Department to arrange for Ohr to be interviewed by Committee staff. Grassley wrote that he wants to know whether Ohr continued to pass information from Steele to others at the FBI after the bureau terminated the former MI6 man as a source for disclosing his relationship with the FBI to the media. The Wall Street Journal—owned by Trump confidant Rupert Murdoch— now there is a shocker, Mich. So why have the DOJ and FBI been covering up the documents demanded by Congress? Well, it is beginning to look like those documents will show that the FBI was paying spies to infiltrate the Trump campaign. So which is the greater threat to our Democratic Republic? The Russians stealing Hillarys e-mails from a home brew server or our government using the intelligence agencies to infiltrate the Presidential campaign of the opposition party? This will be the biggest political scandal in the history of our country. At least one additional government "informant" attempted to infiltrate the Trump campaign under President Barack Obama, former Trump campaign aide Michael Caputo revealed exclusively on Fox News' "The Ingraham Angle" Monday night. "Let me tell you something that I know for a fact," Caputo told host Laura Ingraham. "This informant, this person that they tried to plant into the campaign -- and even into the administration, if you believe Axios -- he's not the only person who came at the campaign. And the FBI is not the only Obama agency who came at the campaign. "When we finally find out the truth about this, Director Clapper and the rest of them will be wearing some orange suits," Caputo told Ingraham, referring to former Director of National Intelligence James Clapper. "This is just the beginning." Last edited by Swampy Meadows; 05-22-2018 at 12:44 PM..
Weissmann may have illegally leaked to the AP. Former Trump campaign chairman Paul Manafort's defense is going after one of special counsel Robert Mueller's top deputies in a bid to persuade a federal judge to order a hearing into leaks to the media. In a court filing Monday night, Manafort's attorneys singled out prosecutor Andrew Weissmann over a meeting he attended with The Associated Press in April 2017 — about a month before Mueller was appointed to take over the Trump-Russia investigation. "It has been reported that a complaint was made to the Justice Department by the FBI with respect to the meeting with the AP reporters, which suggests that normal procedures were not followed in this case," Manafort lawyers Kevin Downing, Tom Zehnle and Jay Nanavati said. The Democrats are confident that no wrong-doing has taken place and never requested to see these documents. I am sure that they are resting well, confident that despite this information being released, they have nothing to fear. “To my knowledge, the Democrats have not requested that information so I would refer you back to them on why they would consider themselves randomly invited to see something they’ve never asked to," she said. McCabe wants immunity. Might have to give it to him if they want to get to those above him. Really seems like Obama was in the loop on all this. A newly redacted Strzok/Page text from December 2015 talks about placing spys in the Trump campaign. December 2015 is around 6 months before Comey said that the surveillance of Trump's campaign started. Definite contradiction to Comey's statement. Interesting development. McCabe must be in deep, deep trouble. It would be a shame to see him get off the hook after abusing our justice system for his own political interests. Give McCabe immunity in an instant if he will tell all on Obama. Once granted immunity, what is to keep McCabe from continuing to protect his buddies by omitting information? I'm uneasy about this immunity stuff because it was abused so heavily in the Hillary investigation. Immunity was given out by a corrupt DOJ to protect its own interests an political motivations. I meant to say unredacted. I think everything in the redacted text was originally released, except for the part about placing the spys in the Trump campaign, and the part about the spys would seem to be the juicy part, which would seem to be why it was redacted, even though I think that the part about the spys should not have been redacted, such a redaction just seems like a CYA move by the FBI. Last edited by ud2; 06-06-2018 at 09:19 AM.. The DOJ and the Republicans in Congress demanding documents have really been fighting it out behind the scenes this week. The DOJ simply refuses to release documents that it has previously promised to furnish. It is a delay and obstruct game, hoping to string this out as far as possible. Does anyone know how "Contempt of Congress" would work in this kind of situation? How would it be likely to play out? I think "contempt" could be charged and it would lead to a vote on the floor (of the House, in this case). If passed, typical punishment would be imprisonment up until the end of the current session of Congress. The DOJ needs this enema to loosen things up. Last edited by Fudd; 06-07-2018 at 07:17 PM.. The IG report is due to be released on June 14th. Horowitz may testify about the report before a Congressional committee on the 18th. It's a segue, but a minor one IMHO. It t'aint just these folks, as we know, but many others. The D.C. swamp is pretty wide and has some depth in and around Washington. Anyhow, it seems the CFPB is being cleaned up of it's ideologues by Mick Mulvaney, while Pruitt at EPA, IMHO, is working wonders too. These BHO regulators are being ousted and (IMHO) this regulatory reform is every bit as important as getting tax reform in as a shot in the arm for the hard working, tax paying public and their employers. To me, it's like a Mickey D's slogan: "Im lovin' it!" McCabe expected to plead the 5th to Congress. This duplicitous, subversive moron needs to join his partner in crime John ("The Clap") Clapper in shackles, IMHO. It should be an interesting day with the release of the Clinton Investigation portion of the IG report. Also, in the continuing battle by the FBI and DOJ to conceal documents from Congress, Rosenstein reportedly threatened Congressional staffers with the specter of the FBI turning it's own investigations on them. The framers of the Constitution rolled over in their graves. Apparently, Rosenstein will do anything necessary to defy Congressional oversight as spelled out by the Constitution. Anyone concerned with that?........Bueller?....................Bueller? Rosenstein reportedly threatened Congressional staffers with the specter of the FBI turning it's own investigations on them. The framers of the Constitution rolled over in their graves. Apparently, Rosenstein will do anything necessary to defy Congressional oversight as spelled out by the Constitution. Staffers for Devin Nunes apparently threatened to hold Rod Rosenstein in Contempt of Congress in a recent meeting. He told them if they did, he would have the right to subpoena their communications and put them on the witness stand to prove them wrong. He's 100% right about that. If that's what happened, Nunes' staffers should not have felt personally attacked. Rosenstein was just telling them the consequences of taking a very foolish action against him. He has a right to due process, and during that process, the facts matter. Swampy, are you making the case that the FBI has the right to threaten Congress with retaliation if Congress exercises its Constitutional obligation of oversight of the Executive Branch? This is our system of checks and balances. The FBI cannot usurp the power of oversight of itself. Simply provide the documents that have been demanded by Congress. If nothing illegal has taken place, there is nothing to fear. Anything less than full compliance is Contempt of Congress. Rosenstein has no leg to stand on here. Continue the colonoscopy! Go Deep! Last edited by Fudd; 06-14-2018 at 10:23 AM.. The colonoscopy starts today with the IG report. Apparently swampy like most liberals, doesn’t understand the Constitution and our checks and balances. Congress has FULL oversight authority over DOJ. In fact, Congress created the DOJ. If the DOJ defies Congress the remedy is contempt. Period. The Justice Department's ethics watchdog reportedly found no evidence that the political leanings of two FBI officials, who exchanged text messages critical of President Trump during the 2016 presidential race, directly affected the FBI's investigations, while noting that their conduct "cast a cloud" over the bureau's actions. Last edited by Swampy Meadows; 06-14-2018 at 11:48 AM..
FBI agent Strzok texted 'we'll stop' Trump from becoming president, IG report reveals. This text was not turned over to Congress. It was the IG who got it. So you can see who was trying to subvert the election. Watch the Media today try to protect their side. No matter what is in the report, the Media will try to defend Hillary. This was omitted when given to Congress. Serious grounds for criminal prosecution. Extraordinary hate and anti-Trump bias at the top of the FBI. And what is going to be done about it? Last edited by Mich Flyer; 06-14-2018 at 09:34 PM..
A congressional source told Fox News that Page’s text about Trump “not ever going to become president” was produced to Congress, but Strzok’s response that “we’ll stop it” was not. So was the Strzok text not revealed in the interest of national security? Just another example of why the DOJ cannot investigate itself or be in charge of evidence redaction that could implicate itself. Deep State run amok. Conflict of interest. These things are hidden so that the public does not know how deeply our government has been corrupted. The DOJ is not going to release evidence that embarrasses and implicates itself without being forced to do it. This is why the DOJ/FBI leaders must comply with Congressional oversight under force of Contempt of Congress or Impeachment. Otherwise they will continue to bury evidence like this. Last edited by Fudd; 06-14-2018 at 02:01 PM.. Someone joked on one station that Comey needs to be out of the country this weekend. Later it was confirmed, he is. WAPO headline just now “ others at FBI showed willingness to harm Trump”. The very liberal WAPO now has to admit it. Swampy, please learn to read. The report then states the the IG didn’t give much credence to the 4 BS reasons given and went on to state the IG does NOT have confidence that “ decisions to prioritize the Russia investigation over following up on mid year-related investigation lead discovered on the Weiner laptop were free from bias”. For those of you in Loma Linda, that means there was bias shown by Strzok and others to slow walk the found Weiner emails and instead push the Russia BS to ham Trump. 2. Three additional, unnamed FBI employees -- including one lawyer who later worked on the Mueller probe -- are under scrutiny for anti-Trump bias. 3. Investigators didn't give a good reason for not pursuing laptops and cellphones belonging to Clinton's senior aides. 4. Despite Clinton connections, former Assistant Attorney General Peter Kadzik and former Deputy Director Andrew McCabe didn't fully recuse themselves . 5. 'Insubordinate' Ex-FBI Director James Comey repeatedly violated policy and inaccurately described the legal situation surrounding Clinton's emails. 6. Former Obama Attorney General Loretta Lynch made errors in judgment during the Clinton probe. 7. FBI agents' actions surrounding the DOJ/FBI interview of Hillary Clinton were 'inappropriate' and created appearance of bias. Question: why does Strzok still have a job at the FBI? Prove them wrong about what? They have authority over Rosenstein. He answers to Congress, not the other way around. Only one problem: The FBI went out of its way to NOT make public the Trump campaign/Russia investigation while Comey's hand was forced into reopening the Clinton email investigation days before the election which ultimately torpedoed the Clinton campaign. One problem: Comey reopened the investigation because the NYPD threatened to expose their cover-up if they didn't. That Comey reopened the Clinton scandal to help the Trump narrative is nothing but a desperate diversion. Why did Comey lie to us about the fact that Hillary's home-brew server was hacked by foreign powers? He claimed that it was "possible", but knew that it actually had been compromised. Why the lie? What possible motivation could he have had? There is a bunch of stuff in this report like that. How can the claim be made that these decisions were not politically motivated? It's insulting to everyone's intelligence. Continue the colonoscopy! Go Deeper! Last edited by Fudd; 06-15-2018 at 10:26 AM..
Why did Comey lie to us about the fact that Hillary's home-brew server was hacked by foreign powers? Did someone higher than Comey tell him to scratch the Hillary investigation - like indications it was Obama? The IG proves key players in Trump Russian Collusion Investigation were politically motivated. Therefore, the investigation was tainted and should be scrapped. Stop watching Faux News and listening to Rudy G. The IG Report has absolutely nothing to do with the Russia investigation. They need to throw away the key on Manafort's cell. He is a now officially a criminal. Sources close to Trump legal team tell @ABC they're "stunned" by Manafort bail decision. No response yet from the President's attorneys on today's development. Last edited by Swampy Meadows; 06-15-2018 at 01:53 PM..
What is untrue about Trump's tweet? You need to wake up. First, the “specific investigations” reviewed were the Clinton email matter. Second, of course they didn’t find a document that stated “ I did this solely because I wanted Trump to lose”. If you knew anything about direct vs circumstantial evidence you’d know that most cases are proven with circumstantial evidence. Criminals don’t often leave letters explaining in detail why they did what they did. That’s why you look at the circumstances surrounding the events. That’s all the IG stated- he didn’t find a document that stated “ I pursued Trump harder than Clinton because I wanted Trump to lose. However, he found the circumstantial evidence quite substantial. That’s why he used the language that he had no confidence that bias didn’t play a factor. Stop watching idiots on main stream news who either lie or are completely ignorant of how evidence is produced. False. Has nothing to do with Fox news. The IG did not find a Memo that documented political bias, but bias was well documented by the IG in the comments and action of the players. When you hear the IG testify before Congress on Tuesday, you will hear about the bias in the top DOJ. It sure does have to do with the Russia investigation, as those biased against Trump went on to work against Trump after they cleared Hillary. What the report found was that there was individual bias, not systemic bias. What it implies is that while the bias wasn't a command from the top, it was passively encouraged. Mich I will grant you that the FBI agents may have been biased --hell I'm biased and so are you. But the fact that they are biased doesn't mean squat if they don't act on it. Which is what the IG report determined. Had they acted on their bias, they would have leaked that Trump's campaign was the subject of an active investigation into collusion with Russia. The report never said they didn't act on their bias. It says there was no documented Memo saying they were going to act against Trump. Comey, Rachel and swampy are the only 3 people in the US who believe the FBI agents - who called Trump voters 'retarded', called Hillary the 'President' months before the election and reminded each other to take it easy on Hillary when interviewed - didn't act on their bias. But did they "act against" Trump? No they did not; they acted against Clinton. They got it so Comey could get open a Russian collusion investigation against Trump, didn't they. The acted 'for' Clinton...to the point of even texting 'I'm with her'. C'mon swampy...did you read anything past the headline(s)? The one thing to keep in mind here is that the IG is not done. There will be an additional report on the leaks to Rudy and Joe DiGenova from agents in the NY field office. ...additional report on the second investigation into the FISA abuses. 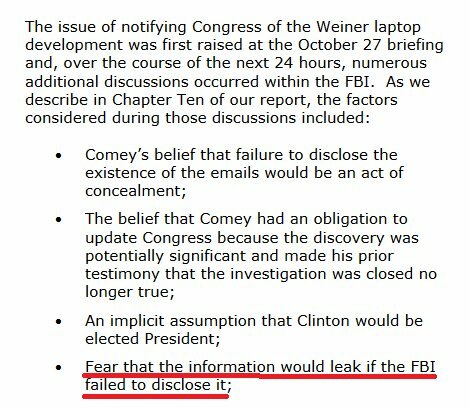 In fact, there were so many instances of bias shown against Trump that the IG stated that while there wasn’t an actual document admitting it, he had no confidence that bias didn’t exist in slow walking the Weiner emails. What he is saying is based on all the evidence , ie, texts emails and interviews, he believes that there want only a bias, but it caused the FBI to more aggressively pursue the Russia matter and delay the Clinton email matter. I don’t understand why this is so hard to comprehend? This is an exhaustive look into the entire matter. There was not a soul in the FBI building who acted against Clinton. They were playing CYA when they thought it was going to leak that they were sitting on potential new evidence in the Clinton investigation for a month before the election. Comey himself promised Congress publicly that he would update Congress if such a thing occurred. If it leaked that he was sitting on it, it would have been a big scandal that would have looked even worse against Clinton. His hand was forced by word that it was going to leak from the New York authorities who were knowledgable about it. In every other way, the Clinton "investigation" was a sham for the sake of public perception that broke every basic protocol of a real investigation. Read the IG report. The "investigators" could not come up with any convincing reasons why they acted like they did. It was a put-on. Last edited by Fudd; 06-15-2018 at 09:06 PM..
C'mon, the fact that they are the only ones reporting this does not mean that it is false, I think we should all know that by now. Just because the MSM cabal does not report on it, does not make it untrue. PAGE: "[Trump's] not ever going to become president, right? Right?!" STRZOK: "No. No he won't. We'll stop it." So why is Strzok still with the FBI? What was the insurance policy? Steve Hilton: The elite embrace selfishness, bigotry and hatred of Trump and his supporters. Trey says that the Speaker of the House informed the FBI and DOJ that if they do not provide the documents requested by Congress, that there will be action this week on the floor of the House to use Congresses Constitutional powers to hold them accountable. Continue the colonoscopy! Go deep Trey! Don't stop until you touch the back of their teeth! Last edited by Fudd; 06-17-2018 at 09:11 PM..
FBI Director Christopher Wray definitely seems to be part of the Swamp, and he was appointed by Trump. Is the FBI so terribly screwed up that we can't get an honest, by the book person to be the director? What is wrong with the FBI? When did the FBI become such a terribly corrupt agency? And what can we do to fix the FBI? When can we dismiss Wray? Last edited by ud2; 06-18-2018 at 10:02 AM..
Is the FBI so terribly screwed up that we can't get an honest, by-the-book person to be the director? J. Edgar Hoover would like to know that too.